Vadim Slavin, David H. Laidlaw, Song Zhang, Rovert Pelcovits, George Loriot, and Anderw Callan-Jones. Visualization of Topological Defects in Nematic Liquid Crystals Using Streamtubes, Streamsurfaces and Ellipsoids. IEEE Visualization 2004 Poster Compendium, October 2004. (pdf) (ppz) (zip) (bibtex: Slavin-2004-VTD). Gordon Kindlmann, David Weinstein, and David Hart. Strategies for Direct Volume Rendering of Diffusion Tensor Fields. IEEE Transactions on Visualization and Computer Graphics, 6(2):124-138, April-June 2000. (pdf) (bibtex: Kindlmann-2000-DVR). Gordon Kindlmann, David Weinstein, and David Hart. Hue-Balls and Lit-Tensors for Direct Volume Rendering of Diffusion Tensor Fields. 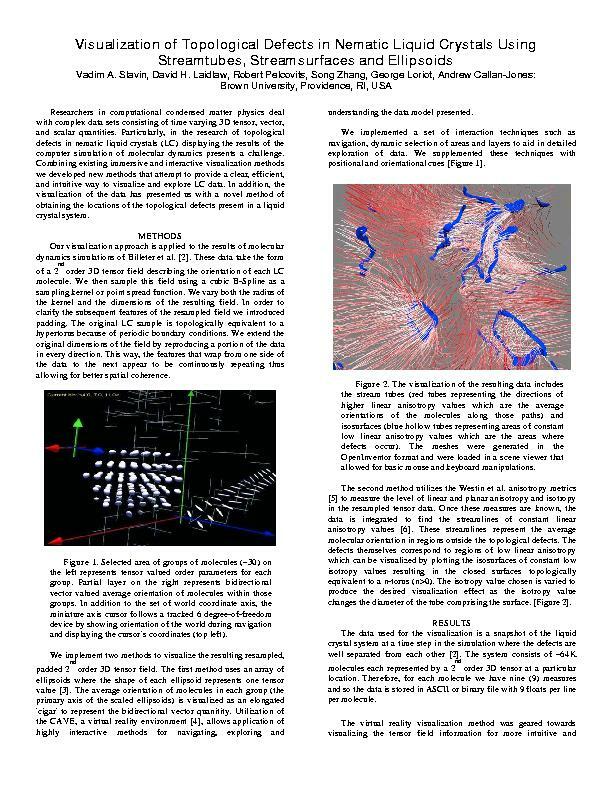 VIS '99: Proceedings of the conference on Visualization '99, pages 183-189, 1999. (pdf) (bibtex: Kindlmann-1999-HBL). Jeffrey Billeter and Robert Pelcovits. Simulations of Liquid Crystals. Computers in Physics, 12(5):440-448, Sep/Oct 1998. (pdf) (bibtex: Billeter-1998-SLC).